In the entire world there are few things that can strike fear into the heart of a king. The sight of his army retreating would be high on the list, and the royal taster clutching his stomach and collapsing would be even higher. At the very top, however, there could be nothing to rival three very angry dragons the size of warships towering over you and asking questions for which you have no answers. Although King Lavarran II of Savaria was backed up by five thousand of the city militia and fifty of his shapecasters, he felt very exposed. He was standing on the open plain outside his palace to shield him from the forge-hot breath of the dragons – not that the palace walls would have stopped the dragons for very long. The three dragons hovering above the city are puzzled. They sense the presence of a young dragon in the city of Savaria, but there hasn’t been a dragon hatchling for 3000 years. Although they can tell when a human is lying, their questions to the king and his court don’t provide any helpful answers. But the answers do buy the humans some time. While Velza and Latsar are trying to do their own investigations, Velza’s brother, Dantar and his friend Marko are being both helped and hindered by Merikus in their quest to leave town. Dantar and Velza’s father cannot be found, although his presence and influence is felt everywhere. The race is on to discover just what the warlock, Calbaras is up to. 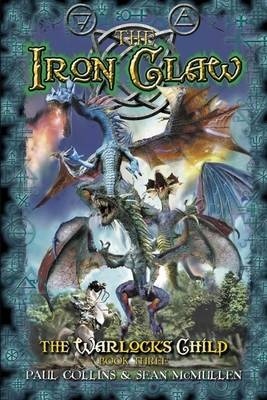 The Iron Claw is book three in ‘The Warlock’s Child’ six book fantasy series. Each is told from three viewpoints: the dragons; Velza, a young female warrior, and Dantar. Velza and Dantar are children of Calbaras a highly skilled but secretive warlock. Neither child seems to have much of a relationship with their father. There are twists and turns aplenty as the children (and the dragons) seek to find Calbaras and also to unravel the mystery of why the dragons seem to be protecting Dantar. Each action-filled title is short enough for younger readers, almost as if the stories are serialised, rather than stand-alone novels. Either way, readers will be looking for the next instalment. Recommended for mid-primary readers. The greatest naval battle in all of history looked trivial from a hight of three miles, but for a dragon the height did not matter. Everything that humans did or build was insignificant. Dravaud had folded his wings back and was dropping like a stone. Far below, he sensed a dragon chick in distress, but had no clear view. The wind had dropped away to almost nothing and the smoke from burning ships hung over the fighting. The ship holding the chick was nowhere to be seen. 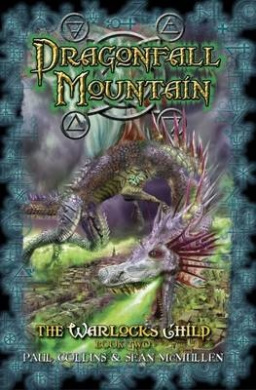 Dragonfall Mountain opens with dragon, ‘Dravaud’, observing from great height the aftermath of a great seabattle. He turns away from the wreckage and sets his sights on the nearby city. Alternating viewpoints of Dantar and his sister, Velza take up the story as they find themselves in the city, Savaria. While the sea battle may be over, there are still many mysteries for Dantar and Velza to navigate, dangers to identify and alliances to understand. Their father is here, but it’s unclear just what his purpose is and whether or not he is to be trusted. All Dantar knows for sure, is that something or someone is looking out for him. Dragonfall Mountain is Book Two in ‘The Warlock’s Child’, a six-book fantasy series, with fantastical cover art from Marc McBride. All six are slated for 2015 release. Dantar is new to war and has much to learn, although he learns quickly. His older sister, Velza, is a warrior, striving to achieve in a man’s world. Together and separately, they adventure and fall, racing to understand what’s happening before a dragon (or more) decide their fate and that of all of those around them. Recommended for mid-primary readers. Even an invasion fleet of five hundred ships is not very impressive from three miles above, and the watcher was not impressed. This was because he was bigger and more powerful than any of the warships below. Drvaud circled lazily on vast wings, reaching out with senses that even the most learned of human wizards could never understand. Something familiar was down there, its presence faint but distinct. It was as tiny as a spark, yet a spark could set an entire city ablaze. The Burning Sea opens with a dragon’s eye view of a warring world. But there is something confusing about the fleet below, something dragon-like. For Dantar, on one of the ships of the fleet below, life as a cabin boy is hard work. Even though he is son of a battle warlock, no one gets a free ride aboard ship. His sister, Velza, aboard another ship in the fleet has gained a foothold in the male dominated forces, but she knows just how tenuous leadership is. And into battle they go. 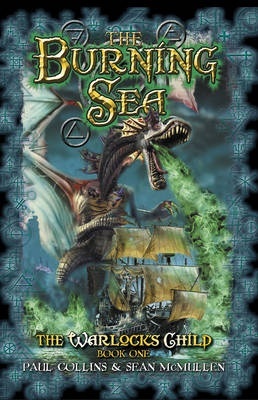 The Burning Sea is a collaboration between two well-known fantasy authors, Paul Collins and Sean McMullen. It is Book One of a six-book series, all slated for 2015 release. Cover art from accomplished dragon-conjurer Mark McBride ensures that young fantasy readers will be immediately engaged. Dantar is an underdog who for reasons slowly evolving is marked as important. There are three viewpoint characters: Dantar, his sister Velza; and Dragons. They take turns in allowing the reader into their world view. Although they have different experiences, this world is full of magic, deception, betrayal – all elements of a grand tale. Recommended for mid-primary readers. For all the smoke, confusion, blood and death before her eyes, the sight of the youth that the others kept calling BC drew Emily’s eyes more than anything else. He shouted the precise orders, led the way, and sprayed fire from his strange rifle as they ran. Dark figures appeared at the end of a corridor, figures that fired pretty sparkles of light that began to cut down BC’s soldiers. BC stood his ground, shooting back at the attackers as one more of those beside him fell. It is 1901 and Australia has just become a nation. Soon, the new Parliament will be opening for the first time. For Emily and her younger brother Daniel, this event is not terribly significant. Their lives will not be changed in any way. Unless, of course, they fall into the Yarra and are saved by a stranger who changes everything. Fox S3 and his commander, BC, are also in Melbourne in 1901. What is different about them is that they are from the future, a future where the world is at war, and life revolves around the preservation of the British Empire. Fox and BC have travelled through time to 1901 to prevent the events which began the never-ending war. To do this, though, they need the help of Emily and Daniel and their dodgy friend, Barry the Bag. Before the Storm is an absorbing time-travel adventure which combines Australian history with futuristic science to take readers on an action-packed ride. There is plenty to contemplate along the way, including the changing roles of women and the realities of war. This is the first title of new imprint, Ford Street Publishing, and a strong beginning to this list.